Veronica Beard skirt in plaid print. 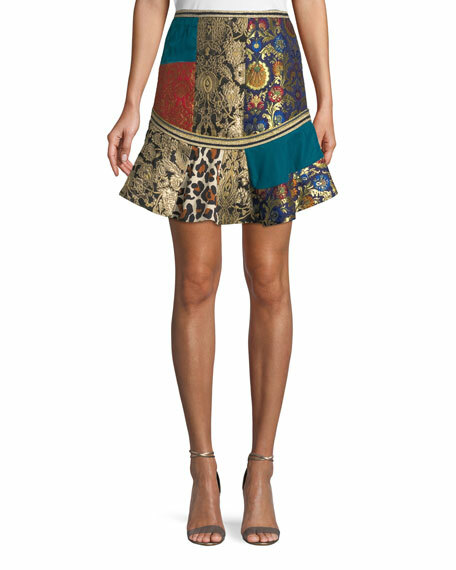 Alice + Olivia "Eriko" skirt in mixed-prints. Approx. 13"L from waist to hem. Fit-and-flare silhouette. Flounce hem. Mini length. Back zip. Viscose/nylon/polyester. Lining, polyester/spandex. Imported. Alice + Olivia "Lennon" skirt in colorblock plaid wool-blend. Straight silhouette. Left side zip detail. Overlapped front. Cutaway hem. Mini length. Back zip. Viscose/wool/virgin wool/polyester/spandex/nylon. Combo, viscose/polyester/spandex. Lining, polyester/spandex. Imported. 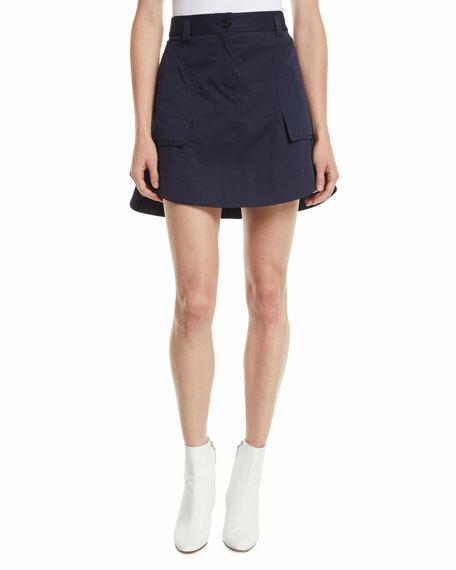 Carven skirt in cotton. A-line silhouette. Side flap pockets. Mini length. Button/zip fly; belt loops. Viscose lining. Dry clean. Made in Hungary. Helmut Lang studded skirt in spongy nylon with padded feel. A-line silhouette. Side-split hem. Mini length. Back zip. Nylon/cotton/spandex. Dry clean. Imported.